A new global study of mobile media consumption from one of the world’s largest mobile ad networks finds that mobile subscribers are spending more of their media time each day with handsets than with television. In a survey of over 20,000 device users across eight major regions, respondents claimed to spend 27% of their media time in a typical day on devices but 22% in front of a TV screen. And yet both TV and phone still fall behind the 32% of time spent in front of a connected computer. In all users who are spending a total of 7.2 hours a day consuming media, 119 minutes is with the phone. inMobi Global Research Analyst Taimour Azizuddin tells Mobile Marketing Daily that the time-spent numbers are not padded by person-to-person chat or even texting. “Time spent on mobile does not include phone calls or SMS,” he says. “We excluded those activities so we could really focus on how mobile devices are being used for media consumption activities.” The infographic highlighting the research is available at the inMobi blog. Not surprisingly, mobile is the anywhere, anytime medium -- but most often used by 47% of us when waiting for something else to happen. And the “second screen” effect is quite real, with 39% using mobile while watching TV. 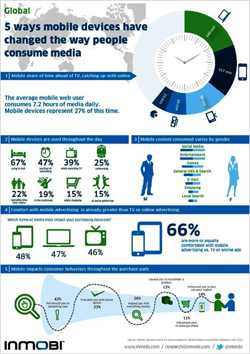 Only 25% of respondents said they use mobile while commuting to work. But bedtime is phone time, apparently, with a stunning 67% saying they use their mobile devices in bed. While historically and in some other surveys consumers have recoiled at the idea of receiving ads on their devices, the inMobi research -- which was done in partnership with Decision Fuel and On Device Research -- shows that 66% of people say they are as comfortable or more comfortable with ads on devices as they are with ads on TV. And as an influencer of actual purchase decisions, mobile was on par with PC and TV, respondents said. In terms of their role in the purchase funnel, the largest share of mobilized consumers (42%) said that mobile advertising succeeded in introducing them to something new. Less than a quarter (23%) felt that mobile ads were saving them time or money. And for now, only 14% said these promotions actually motivated them to buy something over the handset. Given the small number of people who have purchased something over their phones, it is a bit surprising that inMobi says 76% of mobile users expect to conduct some kind of mCommerce. inMobi released the new research at the Mobile World Congress in Barcelona. It sampled over 20,0000 mobile users that it intercepted from its own ad network in the U.S., Brazil, South Africa, U.K., India, Korea and Indonesia. While not focused on heavy mobile users, the survey used people who were already on the mobile Web. Azizuddin says the samples were designed to reflect all mobile users, about half classified as early adopters and the rest late and middle-stage device adopters across smartphone and feature phone owners. inMobi is among the largest independent mobile ad networks worldwide.